In this era of rapid urbanization and depleting arable land, the concept of aquaponics has been gaining momentum for its efficient farming solutions – to those who wish to grow sustainable food in limited spaces. Kijani Grows based in Oakland, California offers Smart Aquaponics systems that combine hydroponic farming and aquaculture in the same closed-loop system. A typical Kijani Grows system is shown in the picture to the below. The system recycles the water between the plants and the fish systems therefore using only about 2% to 10% of water as compared to traditional farming techniques. Along with the water, nutrients needed for the fish and plant growth are also recycled, thus removing the need for soil and fertilizers. Over the summer Kijani Grows started its One School One Garden (OSOG) program using Web-based aquaponic gardens to promote environmental education and awareness. The project also aims to improve access to nutrition and eating habits around the world. Through the OSOG initiative, Kijani Grows partners with schools (K-12) in the United States and connects them with organizations in developing countries including schools, orphanages and community centers. 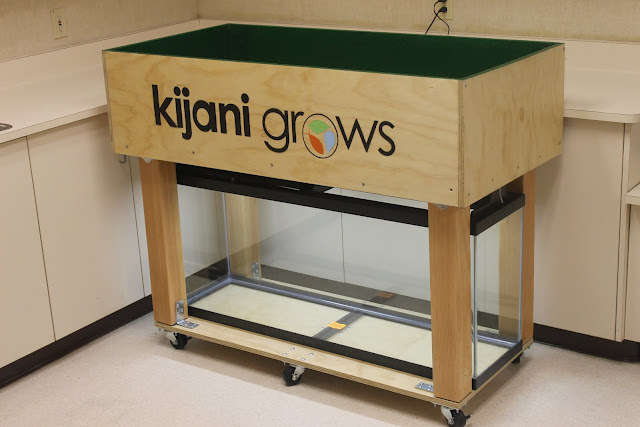 By purchasing a Kijani Grows OSOG kit, American schools receive a Smart Aquaponics Garden and online-based curriculum to provide students with a unique hands-on learning experience. At the same time, a part of the purchase price will be used to send a similar Smart Aquaponics Garden to the school’s partner organization. 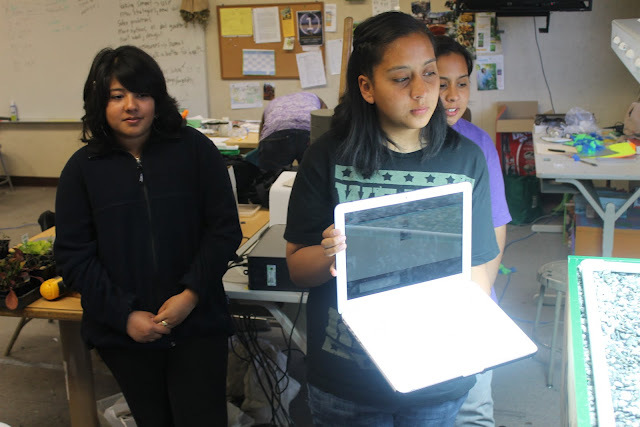 For their pilot project, Kijani Grows is facilitating the collaboration between the PUEBLO program of Castlemont High School in Oakland, California and El Infinito in Quetzaltenango, Guatemala. Students at the Oakland and Guatemala centers will work on similar projects that include putting together a Smart Aquaponics garden and configuring it to work on the Internet. Experiments and assignments pertaining to urban farming will be established using the computer controlled Smart Aquaponics garden platform. Both groups will share the results and insights during and after the project implementation. The picture to the below depicts the Oakland OSOG group showing their garden with their Guatemalan counterparts. Estuardo, a local 19-year-old volunteer with Kijani Grows in Guatemala had the following thoughts after a conversation with counterparts in Oakland, CA – “It’s a great experience to converse with peers from different cultures. Because in doing so we can have deeper, more profound thoughts and exchange ideas. We can learn a ton from other cultures and we can learn ways to create our own projects to protect our environment, therefore improving our nutrition and way of life!”. This program is conducted in partnership with the Sustainable Urban Design Academy (SUDA). The PUEBLO program in Oakland is a community organization that strives to bring reforms in the areas of public health and safety, education, living wage, environmental justice and youth development. El Infinito in Guatemala provides hands-on educational experiences to bring about positive social and cultural changes. In the coming months, Kijani Grows will continue coordinating with other schools and organizations in the Bay Area (Northern California) in efforts to expand the OSOG program. Additionally, the company team will be transforming a retired gun range that was handed over by Castlemont High School into a large scale community project. This project is aptly named as ‘Guns to Gardens’ and is an extension of the OSOG pilot project.